The Alma Memorial Hospital opened in 1951 - and the first Hospital Ladies' Guild meeting was held July 8, 1951 . At the beginning these ladies worked in a different capacity than the Auxiliary ladies of today. The officers of the first group were Mrs. Val Mahoney, Mrs. Don Flasnick, Mrs. Bud Roll, and Mrs. William Wynne. They had a canning and freezing committee. They canned fruits and vegetables, made jelly and dressed and froze chickens for the Hospital patients to eat. They presented over 200 articles of food to the Hospital when they opened. When the Hospital was ready to open, they got together and scrubbed, waxed, and cleaned the entire building. Their first Bazaar was held in October after they opened and the third Thursday in October has remained "Bazaar Day" for over fifty years. The noon menu has remained almost the same throughout the years. For several years, they also had an evening variety show presented by local talent. They had an ongoing used clothing booth which one lady ran from her home all year long. The craft booths have changed slightly during the years. An apron booth, used to be very popular, but with the decreased use of aprons, it is no longer needed. The Alma Memorial Hospital had served the community well, but after 18 years, a larger structure was needed. So, Harlan County Hospital came into being. 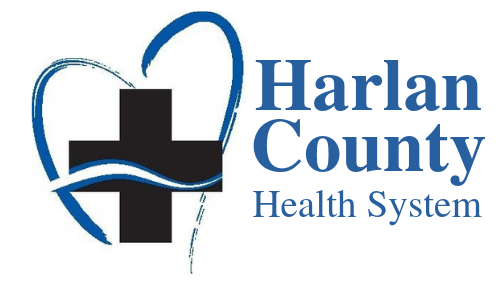 The Hospital Ladies' Guild changed its name to Harlan County Hospital Auxiliary. Today the ladies are as active as ever, though in a different way. The October Bazaar is still held-still the third Thursday. A quilt is hand made each year and tea towels are made to sell-instead of using them in the hospital kitchen. Craft booths are still in existence at the Bazaar and an ongoing supply of crafts are available at the Hospital Craft Cupboard. A monthly project is usually held with additional funds for the Auxiliary and the Auxiliary operates the vending machines at the hospital. All this allows thousands of dollars to be donated to the Hospital annually. For information on how you can assist the Auxiliary in its activities, contact President Jana Cochran or Treasurer Rebecca Fleischmann at 308-928-2151 or through the hospital switchboard.